With the Tales [i.e., me] on vacation with the fetching Mrs. B, enjoy this repeat post from a couple of years ago-with a couple of changes. As I have stated before on my classical music posts, my favorite form of music in the classical music repertoire is the concerto. And since my favorite two instruments are the piano and clarinet I really put at the top of my favorite concertos Mozart's clarinet concerto and the numerous piano concertos from Mozart, Beethoven, Chopin, Schumann, Brahms, Tchaikovsky, Mendelssohn, etc. But I also love the great concertos featuring the violin and orchestra. While there are many great violin concertos I have tried to narrow them down to my top four. These top four I have picked also just happen to be four of my favorite composers [with a couple notable ones that are not in there, Mozart and Bach]. 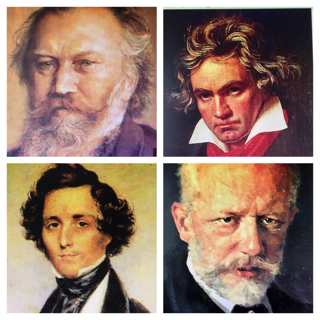 My top four violin concertos are from Beethoven, Mendelssohn, Tchaikovsky and Brahms. The order, I will list below from #4 to #1. Brahms concerto is scored in D Major with 3 movements: 1. Allegro, 2. Adagio, 3. Allegro giacoso- ma non troppo vivace; the Beethoven Violin Concerto in D Major has 3 movements: 1. Allegro ma non troppo, 2. Larghetto, 3. Rondo - Allegro; Mendelssohn scored his violin concerto in E minor with 3 movements: 1. Allegro molto appasionato, 2.Andante, 3. Allegretto non troppo - allegro molto vivace; and the great Tchaikovsky violin concerto is in the key of D Major with 3 movements: 1. Allegro moderato, 2. Andante and 3. Allegro Vivacissimo. In the You tube videos below, I have chosen the soloists: Hilary Hahn on the Brahms, Maxim Vengerov playing the Beethoven, Julia Fischer the Mendelssohn and Joshua Bell performing the Tchaikovsky. Please turn up the volume, play in full screen and enjoy these violin concerti masterpieces.